Losing faith in lithium-ion batteries. Kārlis Dambrāns via Flicker. Click for original. Southwest Airlines may want to get in touch with Samsung for its next "Want to get away?" commercial. As if the company needed more bad PR over its battery situation, the company's affiliate battery plant in China caught on fire earlier today. Reuters describes it as a "minor fire" at the Samsung SDI Co Ltd factory, one that was caused by waste products containing faulty batteries. The fire has since been extinguished and there were no injuries reported, but this is the last thing Samsung needed to happen. It also reflects poorly on lithium-ion battery technology. Starting with Samsung, the company's trying to move on from a global recall of Galaxy Note 7 handsets that were prone to overheating and exploding. There were multiple reports of personal injuries and property damage resulting from defective Galaxy Note 7 devices. Samsung thought it had a handle on the situation when it swapped out the battery and began replacing defective models, but it wasn't long before there were reports of replacement devices overheating and catching fire as well. Following the recall, Samsung investigated the matter and determined that faulty batteries were to blame in both cases, even though the batteries came from two different manufacturers. As a result, Samsung decided not to launch its upcoming Galaxy S8 flagship at Mobile World Congress this month as planned so that it could put the new phone's batteries through a more rigorous qualification process. Now this. 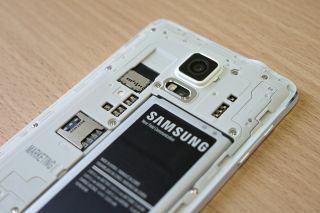 The good news for Samsung is that the fire wasn't caused by new batteries, nor did it break out on the production line. It originated (and was seemingly contained to) a part of the factory that is used for waste. While this is obviously another black eye for Samsung (to some extent, anyway), it's yet another incident that casts lithium-ion batteries in a negative light. In semi-related news, video has surfaced of a Dell laptop catching fire four times while charging. Devon Johnson, an 18-year-old from Thousand Oaks, California, was eating pizza and playing video games with a friend when the incident occurred. The laptop was just a few feet away when it burst into flames, NBC4 Los Angeles reports. "Thank God it didn't explode in my face," Devon said. Devon had plugged the laptop in to charge. A few hours later smoke started coming out the side right before it was engulfed by a fireball. The laptop is toast and there is some damage to the nearby sofa, but luckily for the Johnson family Devon and his friend were around to put out the fire and unplug the notebook. After unplugging it, the two teens took the laptop outside where it again caught on fire. They blew the flames out but it burst into flames a few minutes later for a third time while still unplugged. That time they used a fire extinguisher to put it out, seemingly for good, except that it caught fire a fourth time. "We are coordinating with Mr. Johnson to retrieve the product and will conduct a complete investigation to validate its origin and understand its full history. There is a wide spectrum of potential reasons for what's seen in the video," Dell said in a statement. There are some things you can do to mitigate the risk of something like this happening, or from turning into an even worse situation. Not leaving your laptop or other lithium-ion powered device plugged in and charging overnight or while you're away at work is one of them. What's really needed, however, is a battery technology that is less prone to overheating and catching fire. Update: Dell provided us with a statement regarding the exploding laptop. As it turns out, the battery was a third-party solution and not one that Dell manufactured or provided. "We have concluded our full investigation. The battery involved was not manufactured by Dell and was not an authentic Dell battery. Dell batteries contain Dell intellectual property that helps ensure safety. Remember, it is important to follow the manufacturer’s safety instructions for all electronic devices. Incompatible, counterfeit or third-party batteries may increase the risk of a safety related incident," Dell said. More information on this incident can be found on Dell's blog.